> I am a huge fan of Chris Crutcher. In fact, I just purchased his newest, Angry Management. So when I saw his endorsement on the jacket of Matt de la Pena’s Mexican White Boy I had to read it. Crutcher’s endorsement was all I needed. 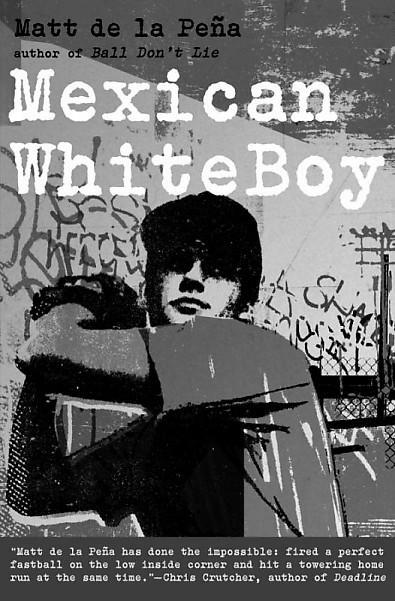 Matt de la Pena’s account of Danny Lopez, a biracial teen trying to balance himself between two cultures, reads like a realistic, biographical account. After his white mother decides to spend the summer in San Francisco with her boyfriend/fiance’, Danny makes arrangements to stay with his father’s family in San Diego. He views this as an opportunity to learn more about his father, who he believes is living in Mexico. Danny wants nothing more than to travel to Mexico and reconnect with his father. Danny struggles to find his way in the Mexican culture that permeates his family. As a biracial child, he’s caught between two world, and he never really feels as though he has a strong foothold in either. Whites view him as Hispanic, while Hispanics view him as white. Teens have a hard enough time carving out their own identities. Danny is constructed as a very sympathetic characters, one teens can relate to without ever having walked in his shoes. But de la Pena doesn’t stop there. Danny is also caught in the middle of another huge conflict, no unlike many teens today – he wants to know as much as possible about his father; his family want to shield him from being hurt. This is rather typical behavior for families, which attempt to shield their children from issues they feel are too overwhelming. Danny, like most teens, sees this roadblock as temporary and continues investigating, brilliantly illustrating the point that sometimes parents and family members need to be honest and discuss issues they feel their kids might not be ready to hear. Danny’s one saving grace is baseball. But he’s just as wild and uncomfortable on the mound as he is fitting in with his family. As the book progresses, baseball takes on tremendous symbolism. If Danny is ever to figure out how he fits in culturally, he’ll have to find a way to smooth out his pitching mechanics and relax. Teen readers will be able to relate to the many other tough decisions Danny faces. He’s in love from afar with a gorgeous Mexican girl who only speaks Spanish. Danny speaks no Spanish, so communication is tricky at best. He wants to stay true to his Mexican heritage, which leaves him feeling as though he’ll need to keep his mother at arm’s length. He feels alone and on display at the private school he attends, where the student body is largely white. Matt de la Pena is an author I’d like to read more. I’m glad I followed my gut and took Chris Crutcher’s word for the book. de la Pena’s reminds me a lot of Crutcher, which bodes well for his future.